The gotipua dance tradition came into being in the 16th century. Young boys dressed in female garb danced for audiences. The classical Orissi dance today developed from this gotipua tradition. Young gotipua dancers in training at the Konarak Natya Mandap performed for 24 Evergreen students from the "Dance & Culture" program in April, 2000. 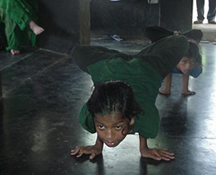 These gotipuas are performing the acrobatic "bandha" dances. Chandra Sekhar Patnaik [Chandrasekhara Pattanaik] was born, 1901, into a rich family of Puri District in the Dimirisena village of Brahmagiri Area. His father Sri Patitapabana Pattnaik and mother Annapurna Dei both had interest in literature. Due to his father�s death, from childhood, he was debarred from higher studies but shown his talent in learning Sanskrita Kabya, Oriya literature and dance, music & mythological literature. He was the only talented person who learned music, dance, instrument and literature at this age. He had established a Gotipua institution. Sri Mahadeva Rout and Sri Gangadhar Pradhan are known as his most well-known disciples in Orissa. He had trained many young persons in dance and music to. He had no children, so he adopted the son of his sister, but his son died while bathing in the sea at Puri at 26. He, then, adopted the dancer Sri Indrakumar as his son. He lived a miserable life, both due to poor health and local politics. He died on May 23rd, 1973, in his own house at Puri. (Notes from Smt. Bidut Choudhary, Odissi Dance).